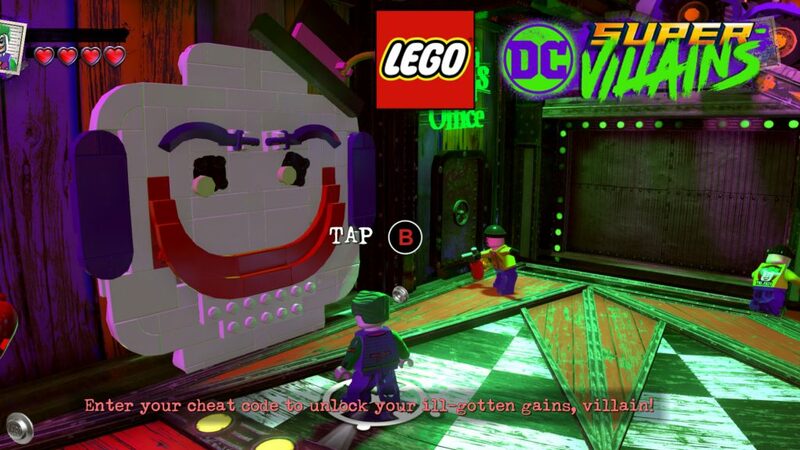 Lego DC Super-Villains cheats are special codes you use in the game. These cheat codes in Lego DC Super-Villains allow you to unlock characters. To enter the cheat codes you will have to play through the first story mission. Once you find yourself inside Joker’s Fun House you will be able to see a panel for entering cheats. Most, if not all, of the unlockable characters can also be purchased for studs. They are quite expensive so usage of cheat codes is recommended. In this guide, we’re going to show you the list of all Lego DC Super-Villains cheat codes, and also exactly what each of them unlocks in the game. To be able to input these cheats you will have to play the first story mission. Once complete you, as Joker, will find yourself in Joker’s Fun House. To the left you should see a clown head that accepts cheat codes. If you exit the Fun House without inputting the codes, you will be able to access the Fun House again only after you finish the second story mission. You will be able to fast travel to Joker’s place and enter it by using a switch next to the door made of chattering teeth. In this particular article we’ll give you a video showing all character unlock cheat codes and a showcase of each. We decided to do this because a lot of other websites copy these codes from us and we wanted to make them work for it by at least watching our video. I hope you guys won’t mind.